One of our most popular items, Unpasteurized Almonds from Spain and Italy, where Mediterranean climate and traditional agricultural practices reign. Non-pasteurized means that these Almonds have not been subjected to temperatures that will destroy the enzymes within. We don't describe any of our other products as non-pasteurized because this fact is something that can be taken for granted. It is not normal or beneficial for a food to be heated to a level that will destroy its nutritional value and we are committed to carrying live foods... The condition of the California Almond crop became an issue when some misguided politician (Under the auspices of the Environmental Protection Agency (EPA), no less) took it upon himself to propose legislation that would require the finest Almonds in the world be made "safe" through pasteurization. In so doing the California Almonds were transformed into a dead food that is far diminished in its capability to contribute to the health and well-being of the consumer... 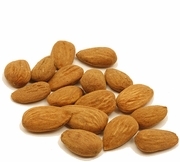 Imported Almonds are not subjected to the mandated requirement of pasteurization and we are fortunate to find European growers who can provide high quality, superior tasting Almonds.